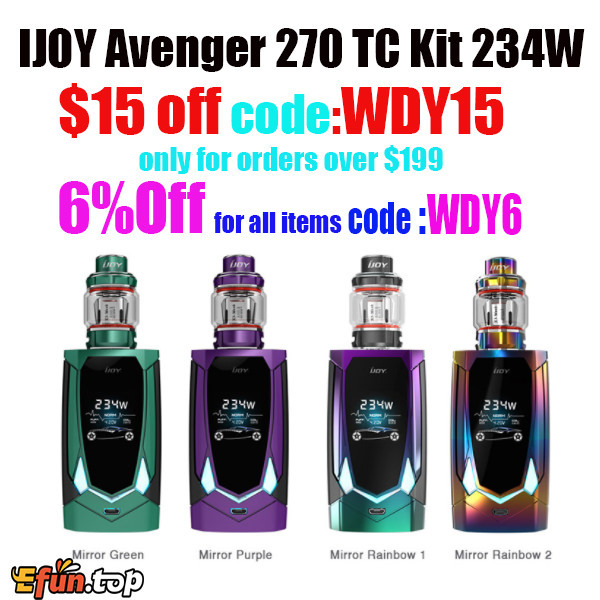 IJOY Avenger 270 Kit is the first artificial intelligent vape kit with voice control in the world. It is compatible with dual 20700 and 18650 batteries (Battery not included, Adaptor included) for long lasting endurance and maximum output can be reached to 234W for large vapors. Avenger 270 Mod features a cool and fashion design, which comes with a large side fire button, TCR function and large colorful OLED display screen to show vaping details clearly. Also, IJOY Avenger Mod supports NI, TI, SS temperature control, customized modes and etc to offer vapers great vaping experience. The included Avenger Tank comes with 3.2ml e juice capacity and can be enlarged to 4.7ml easily by bubble glass tube. Avenger Tank is designed for large clouds with large air delivery. IJOY Avenger adopts X3-Mesh coils for soft flavors. IJOY Avenger Kit is a personalized design kit which can bring you amazing vaping experience.